I’ll never forget the first time a professor looked me in the eye and told me I could go to a top-tier University. It was after a few weeks in my very first class in community college. I had gotten my first pop-quiz essay back and it said “see me” on it. I was terrified. I met the professor in his office and he proceeded to tell me I should be in the college’s honors program and that I could do big things with my life. It was the first time someone expected me to be more than I ever thought possible. This – to me – is what mentorship is all about. And I think this is the kind of mentorship we need to help students of all ages achieve educational goals far beyond their current comprehension. they all can name a very significant person who had an impact on their future. There is a great need for more money and programing to put this kind of mentoring in place on a large scale. But I think we can do more than we realize with the resources we have right here and right now. Ourselves. One of the first peer mentors I had was the first Jack Kent Cooke scholar at the community college where I attended (I was the 2nd Jack Kent Cooke scholar the following year). She spoke at a Phi Theta Kappa meeting about the scholarship opportunity and after she spoke I asked for her help. She then read me her scholarship essays and helped me edit mine. I’ll never forget when she told me that she never charges for such tutoring because it was so important to her to pay that forward. This is significant because in a time with such limited resources it can often seem inefficient to spend so much time with one person when there are so many students that need help and attention. However, we have to remember that those meaningful one-on-one interactions alive with listening, guidance, and encouragement multiply and have an impact far beyond what we could ever imagine. I haven’t seen that professor who called me to do more with my life in many years. I wish I could tell him that I am almost finished with a Masters degree and am about to publish a book because of his mentorship in my life. There is something incredibly powerful when someone expects us to be more and exposes us to what that “more” is. Do you have someone like that in your life? What have you accomplished that you would have never accomplished without that person’s encouragement and mentorship in your life? 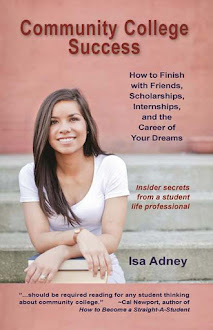 Send me your stories to isa@communitycollegesuccess.com or post them on the Facebook page. If you don’t have such a mentor in your life do not wait for them to find you; check out the vlog above to find out how to find a mentor and what to say in order to start that relationship. This kind of mentorship is vital in every stage of life. I wouldn’t have a book about to be published if it wasn’t for a mentor. I wouldn’t have this blog if it weren’t for the advice of an amazing author I reached out to. I wouldn’t know anything about how to be a speaker if it weren’t for incredible mentors in my life. And I wouldn’t be accomplishing anything I am today without incredible people in my life who believed in me. While mentorship is vital no matter what your age, I believe it is especially crucial for students – and the younger it starts the better. My good friends at the National Society of Collegiate Scholars are currently competing in a Pepsi Refresh Project to help them end the high school dropout crisis through mentoring programs where the scholars in their chapters will mentor middle school students in underserved areas. This is a program deserving of this funding and will be implemented by incredible staff and wonderful students. If you can name one person who has helped you get where you are today then please click the "vote for this idea" button below to vote for this mentoring program so that more and more young people’s lives can be changed by dedicated college students who believe in them, expose them to college culture, and expect them to be college-bound. And wherever you are, whoever you are, strive to reach out to just one person this month. Because only you have lived your life; you have been through things and have learned things that you can pass on to someone else. And you know how to encourage, expose, and expect someone to be more. You have no idea how far such small acts of listening and encouraging can go in someone’s life. It is what we need more of in this world. It starts with you.